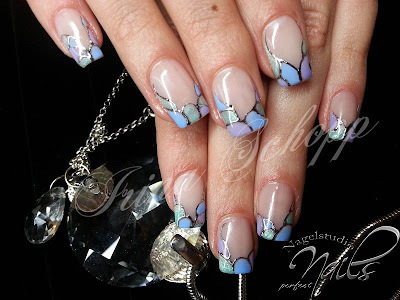 I have an absolutely amazing nail tech for you today: Irina Schopp. Irina holds a very special place in my heart, and let me tell you why. I sent Irina a Facebook message knowing full well that her entire page was in German. And guess what? She went through the trouble of getting her son to translate my message and answered me! She even had him translate the rest of our correspondence so I could interview her for this blog. I've said it a thousand times, but its still true - the nail community really is one of the nicest, most supportive communities to be in. 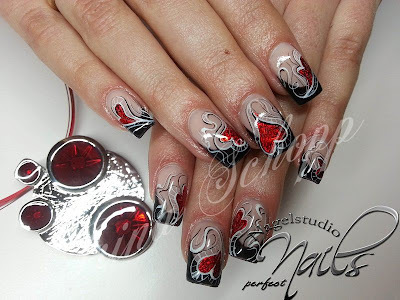 Irina Schopp is a perfect example of what I like to call "Nail Love". Spreading the love of nails to everyone, even if it involves having to get her sons to translate for her! :) I hope she knows just how much I truly appreciate the effort she put into this. 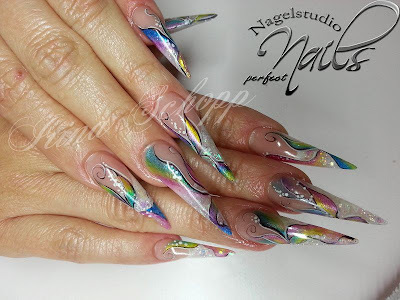 Irina started doing nails because she found that she wanted nail designs that her former nail artist couldn't create for her. So she took things into her own hands and started doing nails on herself, friends and relatives. When strangers started approaching her and asking for their nails done, she decided it was time to get some formal training and started going to as many seminars as possible. Once she was trained, she opened up her own salon, Perfect Nails and her son Albert helped her set up a webpage (www.perfect-nails-dgf.de). She still goes to many seminars to continue perfecting her skills. Some of her favorite seminars are in Russia because she loves their style. She has even did 3 seminars with Nataliia Iakubchuk in Kiev last year. Even more exciting? This year, she will be starting to teach seminars herself! Irina started off using IBD gels. Although she liked them, the line just wasn't suited to her needs - not enough cover gels/make up gels. She found a little company from Munich called Cameleon and has been very impressed with their line of gels. When it comes to acrylic, she works with Alex Beauty Concept. 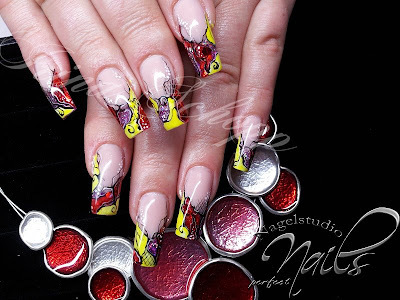 Take a look at her amazing work and if you like what you see, feel free to follow her on Facebook, or visit her salon's webpage Perfect Nails. As for me, I'm still out to sea - counting down the days until I get to go home and back to my nail supplies. I've got a nail contest to enter, and some big changes - including finding a place to live with my boyfriend... and hoping he doesnt go into shock when i set up a mini nail salon in our spare bedroom :) mwahahaha! I'm going to need all the luck in the world for that! :) Not too long now before I hit dry land. Thank you everyone for reading! And thank you Irina for letting me feature your work!